Flemington Presbyterian was the second of the Midway retreat churches. It remains the most active of all the congregations associated with Midway Congregational Church. 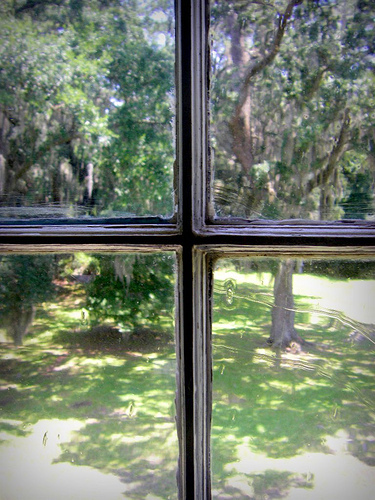 In 1815, Midway member William Fleming established Gravel Hill, a retreat in the pinelands of Liberty County. Like the settlers of Walthourville before them, the people who came to Gravel Hill established a more permanent presence as time passed. For many summers, worship services were held in homes and then in a log structure which also housed a magistrate court. The first permanent church was built in 1832 on land given by Simon Fraser and was used for twenty years. The church followed the organization of Midway and was seen as a branch, not a mission, of Midway. In 1850 the name of the retreat was changed to Flemington in honor of William Fleming. A new home for the old Gravel Hill church was constructed between 1851 and 1852, and one of the selectmen of the congregation, T. Q. Cassels, was the architect. Though an amateur, he was well read in classical civilization and its monuments. The impressive steeple, to this day the pride of the congregation, was built by member Irwin Rahn. By the end of the Civil War, those who had settled in Flemington found the ten-mile trip to Midway nearly impossible, sought and were granted independence. In the spring of 1866, they officially adopted Presbyterianism. Upholding Puritan values of good education, a school was established, known by the 1830s as the Tranquill Institute. Confederate, then Union soldiers, used the old school as a hospital in 1864, and three of the Union casualties are buried in the Flemington cemetery. By the Victorian era, the Flemington Musical Society’s influence on popular entertainment in the area illustrates the shift away from Puritan roots toward a more secular society. 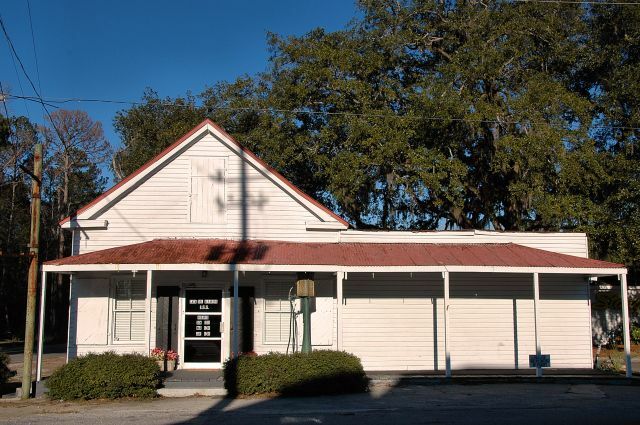 In Liberty County: A Pictorial History (Hinesville, Liberty County Board of Commissioners, 1979), Virginia Fraser Evans writes: The exact date of this store is unknown. It was built by William Bates Trask, originally from Massachusetts. He and Frederick Newsom Lyons operated a general store and the post office in Flemington and Riceboro under the name of Lyons and Trask. Mr. Trask and his wife, Jane Margaret, lived in the house next door. The store and post office were later operated by Peter Fleming Martin, Sr., and Herbert Lowery Stacy, Sr. The store has been closed for many years. The building is well-maintained and the last I recall, was used as a church. In 2014, Francoise Hipp Fussell wrote: I haven’t seen this store since I was 5 years old attending first grade at Bradwell Institute! That was 61 years ago. That is truly amazing. I can’t believe that it’s still there. Sylvia Montez LeMier shared her reminiscences as well: I have sweet childhood memories of walking to Stacy’s Store with my grandmother, Ethel Quarterman Day, and cousins, in the 50’s. In any survey of the early history of Georgia, the name of one church comes up far more often than any other as a seat of power in the colony. 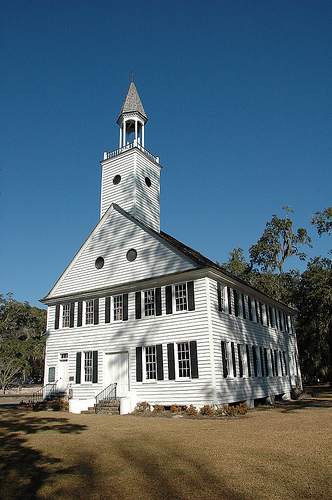 Midway Congregational Church, about thirty miles south of Savannah, was founded by families quite unlike other Georgia colonists, who were usually recent immigrants from the British Isles. The settlers who came to St. John’s Parish in 1752 descended from English Puritans from the counties of Dorset, Devon, and Somersetshire, who settled in the Massachusetts Bay Colony in 1630, naming their settlement Dorchester, after a beloved town in England. They were the first commercial fishermen in New England and had as much a commercial motive for being in the New World as they did a religious one. It should be noted that the town charter of Dorchester in 1633 was the first in Massachusetts and, indeed, in all of the English colonies. By 1636, though, weary of Governor John Winthrop’s dominance and an increasingly authoritarian clergy, many of the families resettled to the Farmington River in Connecticut, establishing the town of Windsor. In part because of their success and the need for more land, and because they felt a calling to “settle the gospel” elsewhere in the colonies, they left New England for good in 1695 and spent the next half-century in South Carolina. Their colony along the Ashley River, which also bore the name Dorchester, soon thrived to the point that land holdings were becoming inadequate to perpetuate their industry. Though a necessity for the cultivation of rice and other labor-intensive crops, their embrace of slavery seemed out of synch with Calvinist ideology, and many of their New England brethren openly expressed disdain with this unusual alliance. However, the Puritan principles of thrift, the dignity of hard work, social and racial superiority, and profit made this alliance inevitable. When large land grants in Georgia were made available in December 1752, Benjamin Baker and Samuel Bacon brought their families to a sparsely populated district between Georgia’s two most important ports, Savannah and Darien. This foray into the southernmost colony was soon met with interest by their South Carolina compatriots. By 1754 the Reverend John Osgood and sixteen families in his charge came to Georgia and officially transferred the Dorchester church and its mission to this new location. In late August of that year, they drew up articles of incorporation of the “Society Settled Upon Medway and Newport in Georgia.” [Medway refers to the nearby Medway River, which ran through historic Sunbury. Some have surmised this to be the origin of the name Midway, though most historians agree that the name is solely geographical.] One of the objectives of the society was to establish peace and harmony among themselves and inoffensiveness to their neighbors, and to this goal they succeeded. 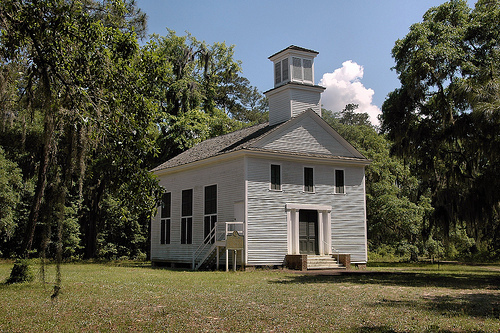 The first school of any importance in Georgia was established by Midway members at nearby Sunbury, and one of the first notable libraries in the state was maintained by the Newport and Midway Library Society, which evolved from the plantation-based Beech Hill Alphabet Society. Some of the best-known names in early Georgia were associated with Midway Church. Two of the state’s three signers of the Declaration of Independence were counted among the membership. Dr. Lyman Hall, whose plantation Hall’s Knoll was located just northwest of the church, was a regular congregant. Hall, who also served as governor, was instrumental in convincing the fledgling, loyalist-leaning colony to vote for independence. Button Gwinnett, infamous for his duel with Lachlan McIntosh, was also a member of the Midway congregation, as he maintained a home and small farm on nearby St. Catherine’s Island. Two important generals of the Revolutionary War, James Screven and Daniel Stewart, were also members. General Screven lost his life in a battle near Midway Church. So esteemed was the patriotism of Midway members that in 1777 the legislature combined the historic parishes of St. John, St. James, and St. Andrew and named them Liberty County. Other prominent members of the congregation included Governors Nathan Brownson, Richard Howley, and John Martin; United States Senators John Elliot, Alfred Iverson, and Augustus O. Bacon; Continental Congressman Benjamin Andrew; U. S. Representatives John A. Cuthbert and William B. Fleming; and the first U. S. Minister to China, John E. Ward. Another member, Dr. Louis LeConte, who owned Woodmanston Plantation and its well-known botanical gardens, was the father of two of 19th century America’s most important scientists, John and Joseph LeConte. John was the second president of the University of California. Supreme Court Justice Oliver Wendell Holmes, Jr., telegraph inventor Samuel F. B. Morse, First Lady Ellen Axson Wilson, and President Theodore Roosevelt were all descended from Midway families. Five Georgia counties were named for citizens of this era: Hall, Gwinnett, Screven, Stewart, and Baker, created in 1825 in memory of Colonel John Baker. In the interim between the Revolutionary War and the Civil War, change gripped the Midway community. Much of the population of Liberty County was pushing westward to the interior, and in this time, the so-called “retreat” communities of Walthourville, Flemington, and Dorchester developed. These retreats were no more than a summer safeguard against the malarial mosquito invasions which plagued settlements near the coast, but their emergence hinted at great changes for the future of Midway Church. The shift in agriculture to a more stable inland base and the destruction wrought by the Civil War hastened the end of the congregation. By 1867 the last regular minister was dismissed. Soon thereafter, the trustees leased the building to a group of African-Americans for use as a church and school. The first retreat of the Midway colonists was located about fifteen miles inland, on higher and sandier ground. Initially, it was known as Sand Hills. Midway member Andrew Walthour built the first dwelling in the area in 1795 and was soon joined by a multitude of others. By 1800 the settlement became more permanent, and the name was changed to Walthourville. In 1820 a Union building was erected, since the retreat population were still congregants of Midway. At first, they went back and forth to the main church for baptisms and communion, but eventually the congregation at Walthourville was established. A new church was built circa 1845, and in 1855 they officially became Presbyterians. At this time they were given independence from Midway, but still maintained a spiritual bond. They were vastly successful as a congregation, being the second largest in the Savannah presbytery and the largest in terms of benevolent gifts. The journal of Judge John LeConte Harden, who spent much of his boyhood in the 1840s in Walthourville, fondly recalled a place called Tea Grove Farms. It was one of the most prosperous in the county, and quite early for a commercial farm; everything from tea, which was in cultivation in several locations around Liberty County at the time, to peaches, pears, apples and scuppernongs was produced at Tea Grove. The descendants of the Midway congregation who now made Walthourville their home were quite industrious and also grew sugar cane and were pioneers in the Southern naval stores industry. Fire destroyed the 1845 church and the present Walthourville Presbyterian Church was built in 1877-78. In 1815, another Midway member, William Fleming, established Gravel Hill, a retreat in the pinelands of Liberty County. Like the settlers of Walthourville before them, the people who came to Gravel Hill established a more permanent presence as time passed. For many summers, worship services were held in homes and then in a log structure which also housed a magistrate court. The first permanent church was built in 1832 on land given by Simon Fraser and was used for twenty years. The church followed the organization of Midway and was seen as a branch, not a mission, of Midway. In 1850 the name of the retreat was changed to Flemington in honor of William Fleming. A new home for the old Gravel Hill church was constructed between 1851 and 1852, and one of the selectmen of the congregation, T. Q. Cassels, was the architect. Though an amateur, he was well read in classical civilization and its monuments. The impressive steeple, to this day the pride of the congregation, was built by member Irwin Rahn. By the end of the Civil War, those who had settled in Flemington found the ten-mile trip to Midway nearly impossible, sought and were granted independence. In the spring of 1866, they officially adopted Presbyterianism. Upholding Puritan values of good education, a school was established, known by the 1830s as the Tranquill Institute. Confederate, then Union soldiers, used the old school as a hospital in 1864, and three of the Union casualties are buried in the Flemington cemetery. By the Victorian era, the Flemington Musical Society’s influence on popular entertainment in the area illustrates the shift away from Puritan roots toward a more secular society. The last of the retreat churches to be established was located at Dorchester. Its origins can be traced to nearby Sunbury, a short-lived boom town founded in 1758 whose trustees were members of Midway Church. Sunbury thrived nearly from its inception, rivaling Savannah in commercial importance, but its proximity to Fort Morris lead to its capture and subsequent burning by British troops during the American Revolution. While many such casualties of the war recuperated, Sunbury never seemed to regain its prominence after the devastating four-year occupation that followed. The hurricane of 1824 and a yellow fever epidemic sent many of its residents scattering into the nearby countryside. Huge plantations with names like Laurel Grove, Arcadia, Melon Bluff, Cedar Point, and Palmyra were emerging in the countryside around old Sunbury. In 1843 upon the suggestion of Reverend Thomas Sumner Winn, a tutor for prominent Presbyterian minister Charles Colcock Jones, a site was chosen for a retreat between Sunbury and Midway. It was originally known simply as “the Village,” but was soon christened Dorchester, in tribute to the heritage of its citizens. Some families built summer homes at Dorchester, though many tore down their dwellings near Sunbury and rebuilt them on the higher and drier ground the retreat afforded. As this new location was only six miles from Midway, the idea of building a church was not initially entertained, though an academy was built in which Sunday school was regularly taught. By 1854, with the continuing decline in membership at Midway, the families of the village built a permanent church, which still stands today. The old town bell from Sunbury, dated 1799, was placed in the steeple. The land was donated by Bartholomew Busby, who owned the nearby Melon Bluff Plantation. At first it was used only in summer, but by the onset of the Civil War was in regular use. The church was officially recognized by the Savannah Presbytery in 1871 and named Dorchester Presbyterian Church. Descendants of the original members continue to gather once each year and on special occasions. 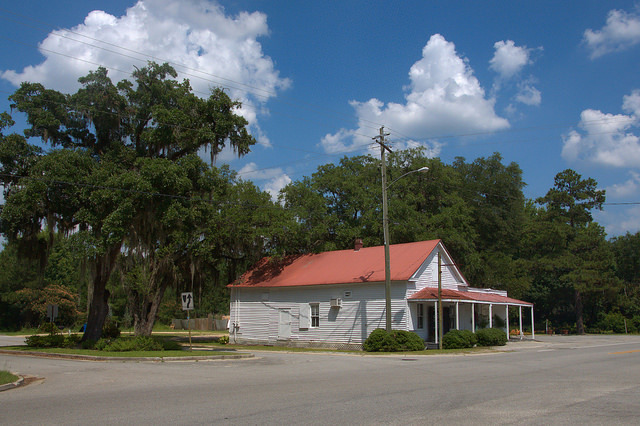 In The Children of Pride, which details the lives of a Liberty County family during the Civil War, Robert Manson Myers said the record of the Midway district was both astonishing and unique for a small rural community that never had a population of more than a few hundred people and that was dispersed little more than a century after its founding. Besides the obvious contributions these relocated Puritans made to the early history of Georgia, especially through service in the Revolutionary War, there was the broader impact of plantation society on the fledgling economy. This fostered an agrarian pattern that persisted well into the 20th century. Moreover, many of the Puritan ideals which the Midway settlers brought from England were instrumental in framing our modern social and legal structure. 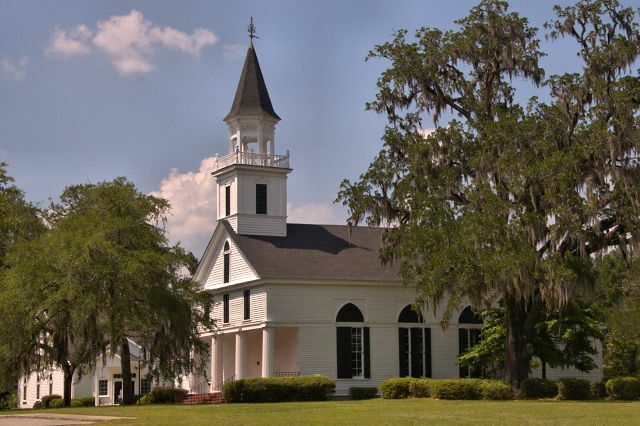 That the three retreat churches remain influential forces in the social and spiritual life of Liberty County today is proof enough of their enduring legacy. 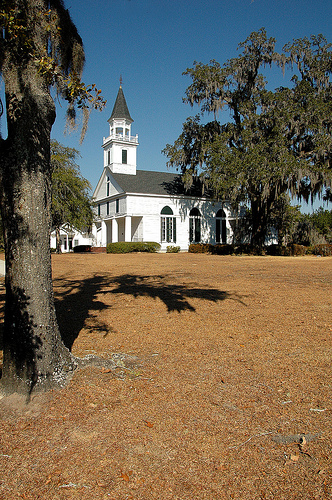 Midway Church is one of Georgia’s most iconic structures. Several buildings have served the congregation in its history. The first was a log structure built in 1754; the second was of frame construction, built on land deeded by John and Mary Stevens in 1756. It was torched by the British in 1778. A temporary church was raised in 1784 and served the congregation for eight years until the present facility was completed in 1792. 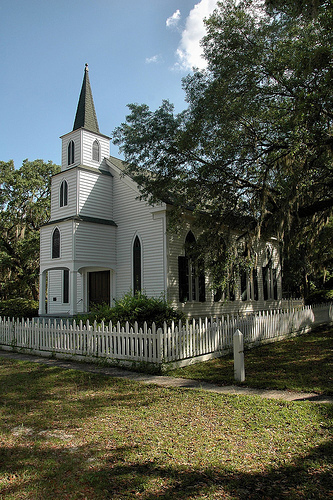 When U. S. Highway 17, also known as the Atlantic Coast or Coastal Highway, was widened in the 1930s, the church was moved slightly to the east. The Midway Museum, built in 1957 and based on the plantation houses typical of the early coastal settlers, is the starting point for a tour of the church. The only way to get inside the church is to visit the museum and ask for a key, though be advised that the museum is closed on Sundays, Monday, and all holidays. All the retreat or daughter churches, as they are sometimes called, are architecturally distinct, with one exception: each features a slave gallery, a balcony at the rear of the sanctuary. The Midway Puritans felt obligated to the religious indoctrination of their slaves. Even after the Civil War ended, many of the freed slaves attended services in these facilities until they could build their own. Midway is the only one of these churches accessible for tours today, as Flemington, Walthourville, and Dorchester are still in use. And keep in mind if you visit Midway Church, the tour is self-guided. The adjoining cemetery, across U. S. Highway 17, is one of the most fascinating in Georgia.